Mobile VoIP software libraries provide native MVoIP solutions for iPhone & iPad and Android phones, tablets and other mobile devices. These libraries extend the developer’s toolset with our native software development kit (SDK) that includes VoIP stacks, industry standard voice codecs and our robust Speech Enhancement algorithms. Our extensive experience in the design, implementation, and configuration of vocal mobile, network, and telephony applications will help you select the right solution for your mobile VoIP application. VOCAL’s MVoIP source code is optimized for DSPs and ARM processors from TI, ADI and other leading vendors. Contact us for a demo or to discuss your mobile VoIP requirements. VOCAL’s Android VoIP SDK software library is optimized to meet unique SIP calling requirements for mobile over IP app developers with support for Android voice codecs, acoustic echo cancellation, and noise reduction algorithms. These libraries are developed in C/C++ for use with the Android SDK. VOCAL’s iOS VoIP SDK software library is optimized for custom mobile SIP client application development for iOS devices and include voice codecs as well as acoustic echo and noise cancellation algorithms. These libraries are developed in C/C++ for use with the iOS SDK. VOCAL’s SDK implements a native SIP stack with VoIP protocols, including SIP, SDP and RTP optimized for iOS, Android and other platforms. The native SIP stack provides access to the speech coders and other software modules and incorporates an adaptive jitter algorithm to further enhance voice quality. The robust jitter algorithm is exceptional at maintaining constant voice output to the listener while quickly and effectively adapting to packet loss and network delays. 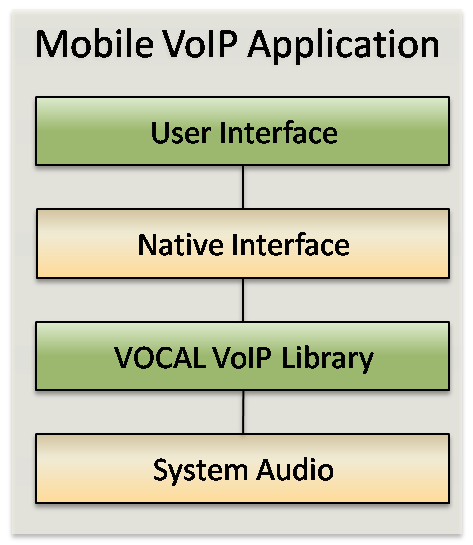 VOCAL Mobile VoIP libraries incorporate a selection of voice and audio codecs to customize applications for unique MVoIP requirements including a full range of ITU, GSM, Wideband, Android, iOS, and other industry standard voice codecs optimized for mobile platforms. Developers should evaluate the characteristics of each vocoder and its suitability for a particular application and/or platform. VOCAL has extensive experience with the selection and configuration of these voice codecs for optimal performance on ARM platforms. VOCAL Mobile VoIP libraries include speech enhancement for improved speech intelligibility with optimized echo cancellation, dereverberation, and noise reduction algorithms. Echo cancellation reduces reflected copies of a direct path wave from the acoustic / mechanical coupling between speaker and microphone; dereverberation handles reflections from surfaces in an enclosed environment; while noise reduction addresses additive noise sources, e.g. wind noise. The combination of these techniques produces superior speech in MVoIP applications. Our mobile VoIP libraries also include acoustic beamforming algorithms to actively focus on and capture the speaker’s voice. Mobile devices are increasingly used as hands-free, speakerphone-like systems where the speaker is often located in a room (or automobile) some distance from the microphone. Beamforming takes advantage of newer mobile devices with multiple microphones to selectively capture the speaker’s voice while rejecting interferes and other sources of background noise.